Here in America we love our fast food. And when you're sitting at home cleaning your gun, drinking a "lite" (Belgian owned) American macro brew after a long hard day of manual labor that pays barely livable wages, and watching America's Got Talent on your 70-inch made in China flat screen that you got on lay-away from Wal-Mart...hold on, that sentence got away from me. Let's try again. I saw a commercial for a new sandwich at Wendy's and I knew in my heart that it was my civic duty to assimilate one into my body. 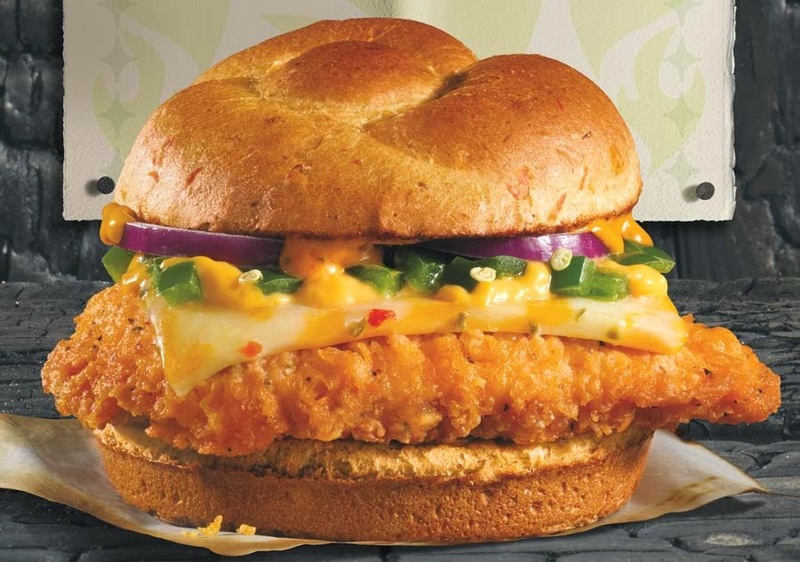 We're kicking up the heat with 5 layers of spice on our new Jalapeño Fresco Spicy Chicken sandwich. It's our classic spicy chicken breast topped with fresh, diced jalapeños, ghost pepper sauce, Colby pepper jack cheese all on a red jalapeno bun. It's too hot to last, so try one today! That's directly from Wendy's website. And, well, that's what's on the sandwich. 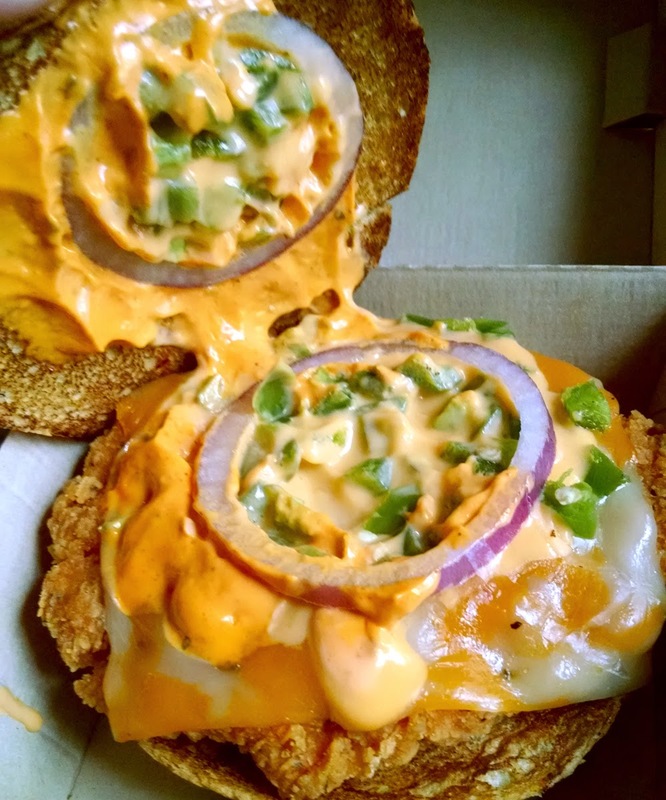 It's their normal spicy chicken patty dressed up with a spicy bun and spicy cheese and spicy jalapenos and GHOST PEPPER SAUCE!!! There's no way they're using real ghost peppers. If they are, it must be in such a diluted ratio to be practically insignificant. Search youtube for "ghost pepper challenge" or something along those lines. You will see the pain these peppers bring. Can you imagine the lawsuits? As you can clearly see, my sandwich looks pretty much exactly like the sandwich in the promotional image. Delicious. The color palette is reminiscent of public school lunches where everything is a variation on yellowish brown. I used the color picker in Photoshop photo-editing-software to isolate the colors of the chicken sandwich. It's making you hungry--I know--I can hear your stomach gurgling from way over here. This sandwich is very 70's chic. It is a well known fact that Dave Thomas was a huge fan of old Winnebago Recreational Vehicles. Let's see what's under the hood of this bad boy. Hey! There's some color! You can see that they used real diced jalapeños and real sliced red onion. You also get a better look at the ghost sauce (woooOOOoooo!) and the colby pepper jack cheese. Bun: It's a special red jalapeño bun. At this point, I am fully over typing the word jalapeno and then right clicking to correct it to jalapeño. It tastes like regular bread, except it is browner and drier making it heavy and gross. I predict that this sandwich will be short-lived if based on nothing else but the bun. Because what really differentiates this from their regular spicy chicken sandwich? You can add a glop of jalapeño cheese goop to any other sandwich and it will be better because it doesn't have this thick and heavy dry terrible bun that is specially manufactured for one specific sandwich. Pretzel buns were a win. This is an epic fail whale. Meat: As mentioned before, the chicken patty is just a regular spicy chicken patty. 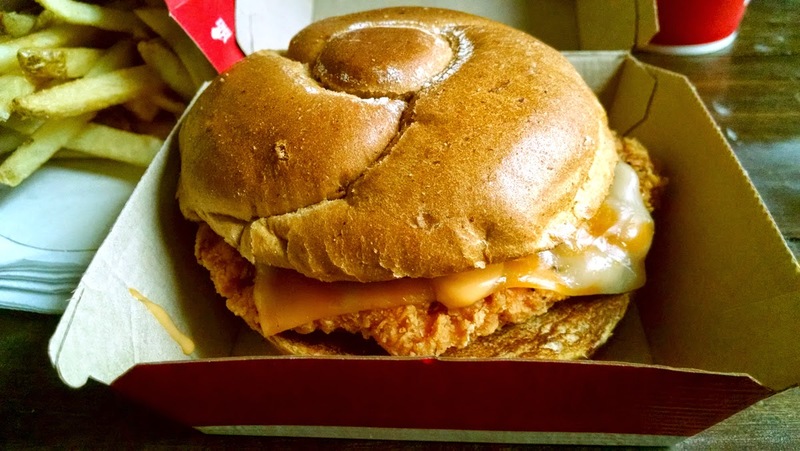 I am a pretty big fan of spicy chicken sandwiches and this spicy chicken patty is a solid entry into that category. It's not really hot, spice-wise. It's more of a tongue tingle than a belly warmer. Pairs well with Hi-C Fruit Punch. Jalapeño Peppers and Red Onion: These are the only veggies on the sandwich so I'll put them both in this category. Although, it's hard to tell if the jalapeños are their own topping or are part of the ghost sauce goop. The peppers tasted fresh and crunchy, so that's good. They weren't from a can or jar (though, frozen maybe). Maybe that's what "jalapeño fresco" means. The peppers weren't too spicy at all. Very mild for jalapeños. But they did bring a nice pepper flavor. Red onion is red onion. I got two rings. It was fine. They were fairly firm and crispy and onion flavored. Ghost Pepper Sauce: The moment of truth! Le piece de resistance! La force majeure! Before I look up the actual ingredients to the ghost pepper sauce, I'm going to guess what's in the ghost pepper sauce. I'd say it's stadium style nacho cheese with assorted dry spices like red pepper and chili powder mixed in. Okay I looked it up. I was close! If you look carefully at the picture you can tell that the stadium cheese and ghost pepper sauce are two different things. The stadium cheese has a slightly more orange color. It was hard to tell since they blend so well into each other. The ghost sauce is a sour cream and mayonnaise combination with assorted dry spices. Essentially. Shoulda known it was a mayo-based sauce. stupidstupidstupid! No, not really. It's not not hot. The sandwich might redden your cheeks a touch, or perhaps bring a tiny bead of sweat to your brow. You might need to blow your nose afterward. The level of hotness, though, is probably milder than your typical buffalo wing sauce. These flamin' ghost pepper claims are highly exaggerated. When compared to the standard Wendy's Spicy Chicken Sandwich, I would 9 times out of ten recommend the standard Spicy. The bun is better and the cool crispy tomato and lettuce are a nice counterbalance to the gentle spice of the fried chicken patty. Is the jalapeño fresco worth trying? I guess. If you like to try new things, or want a sandwich that is slightly hotter. Again, though, I don't foresee this being a long-lived addition to the menu. A small combo meal will set you back $6.79 here in the Middle-West.